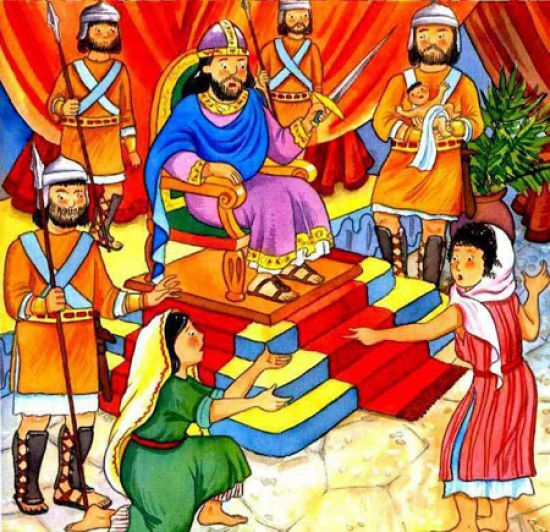 This is King Solomon Story for kids. Once upon a time, when David was the king of Israel, Israel grew ten times larger than it was under King Saul’s reign. Now, David had grown old and feeble and he knew his time in this world was about to end. Adonijah, one of David’s many sons, wanted to steal the throne. His name meant “My Lord is God”. But he wasn’t a good man. He tried to steal David’s throne, knowing that David was too weak. David grew worried. He wanted to leave his throne to a good man. As David was worried, his wife came up with an idea. She recommended their son Solomon to be the next king. Also, read The Tower Of Babel Story. Image Source @dwellingintheword.wordpress.com. At once, David agreed. He called for a meeting with his ministers and named Solomon as king. The people accepted Solomon as their king because David had recommended him. Before dying, David advised Solomon to walk on the God’s path and he shall prosper in whatever he does. Soon after, David passed away. One day, Solomon had a dream. In that dream, a voice asked Solomon, “What do you want?” To this, Solomon only replied asking for the wisdom he required to be a good king. Solomon was granted what he wished for, and God blessed him. One day, when Solomon was sitting in the court, two women entered. The two of them were arguing over a small baby boy. Both of them said that they were the mothers. The duo had come to the king for a remedy. “This woman’s baby died in the night. Then she switched her baby with mine! I am the mother of this baby,” one of the screamed. “No!” replied the other. “The living one is mine.” This argument continued for a while. The king couldn’t possibly know whose child the baby was! But wise King Solomon had an idea. “Bring me the sword,” he asked suddenly. The sword was brought. At that very moment, the king took back his order. And gave the first woman the baby. He then addressed the court and told them that a mother would never let her baby die. And that’s how he knew who the real mother was. All of his courtiers realized how wise there king truly was and respected his judgement. You may also like to read, The House Of Simon.